The SWAMP project was represented in the EUBrasilCloudFORUM Concertation Meeting, held in Brasília (Brazil) on April 18th 2018. The purpose of the meeting was to jointly form a plan of action with EU-BR projects from the 3rd and 4th collaborative calls, to collaborate on the future priorities for EU-BR research landscape in ICT. 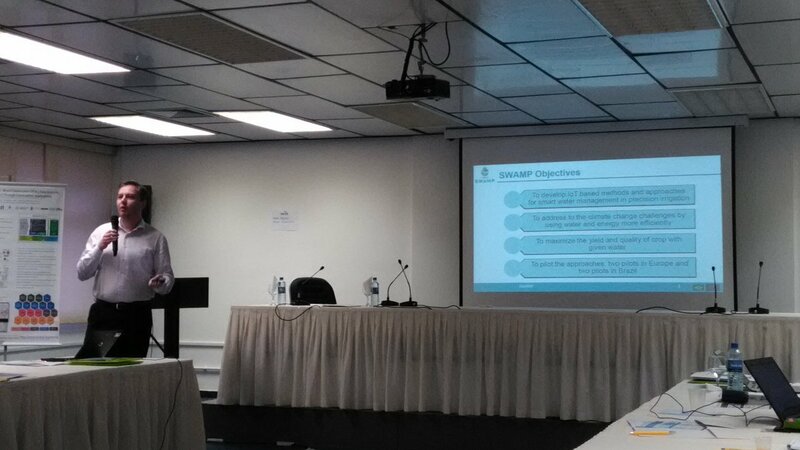 Prof. João Henrique Kleinschmidt from UFABC presented the objectives, pilots and work in progress of the SWAMP project. All the invited projects discussed on how the project’s technical work and cross-border demonstrations will address/have addressed issues such as personal data protection, flows of data, portability of data, etc. The projects also provided recommendations for further actions either in research or policy. EUBrasilCloudFORUM has been funded by the EC and MCTI to support the EU-BR collaborative projects in the collection and promotion of their results and activities. The project is responsible to facilitate the establishment of an organizational cooperation model that enables the EU and Brazil to formulate and develop a common strategy and approach for research and innovation in cloud computing. The consortium prepared the EUBrasilCloudFORUM Research Roadmap, a report that analyses and identifies the gaps and research opportunities related to cloud computing, and also to propose future research topics for the EU-BR collaboration in related areas. This Research Roadmap was presented at the Concertation Meeting, along with the Online Marketplace of relevant ICT assets to support transatlantic collaboration.